New Delhi: Bharti Airtel today launched a new app — Airtel Books. With this, Airtel has further diversified its fast-growing digital content portfolio to add to its popular offerings like Wynk Music and Airtel TV. Available to both Airtel and non-Airtel customers in iOS and Android, Airtel Books will initially offer over 70,000 titles from Indian and international authors. 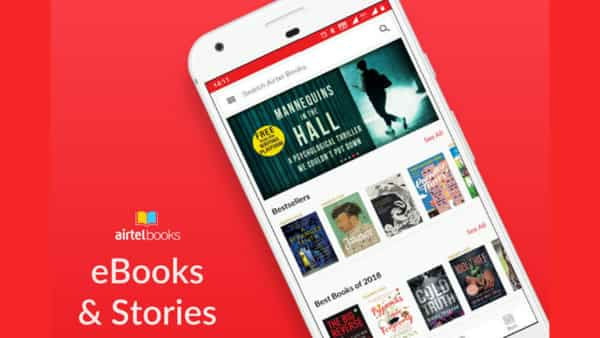 Airtel says it plans to rapidly expand its e-books collection by partnering with leading publishers as well as leveraging its strategic partnership with Juggernaut Books. All Airtel Books users will get a complimentary 30-day trial to experience the app and can access ‘Free’ titles from the Readers Club. Airtel smartphone customers will also enjoy a one-time special benefit of being able to access any five ‘Paid’ titles from the Readers Club, which has a collection of over 5000 e-books. Airtel Books has a subscription service called, Reader’s Club which is priced at ₹129 for 6 months and ₹199 for 12 months. Customers can also buy books on a per book basis. “Airtel Books is another major milestone in our journey towards building a world-class digital content portfolio. E-books are a fast-growing segment along with music and video, thanks to large screen smartphones becoming the cornerstone of the digital lifestyle. We are delighted to roll out this initiative and take it to the smartphone users across India through our deep distribution reach. As we have demonstrated with Wynk Music and Airtel TV, our aim is to use deep customer science to curate great reading content for our users and add to their smartphone experience on our best-in-class network”, said Sameer Batra, CEO – Content & Apps, Bharti Airtel.